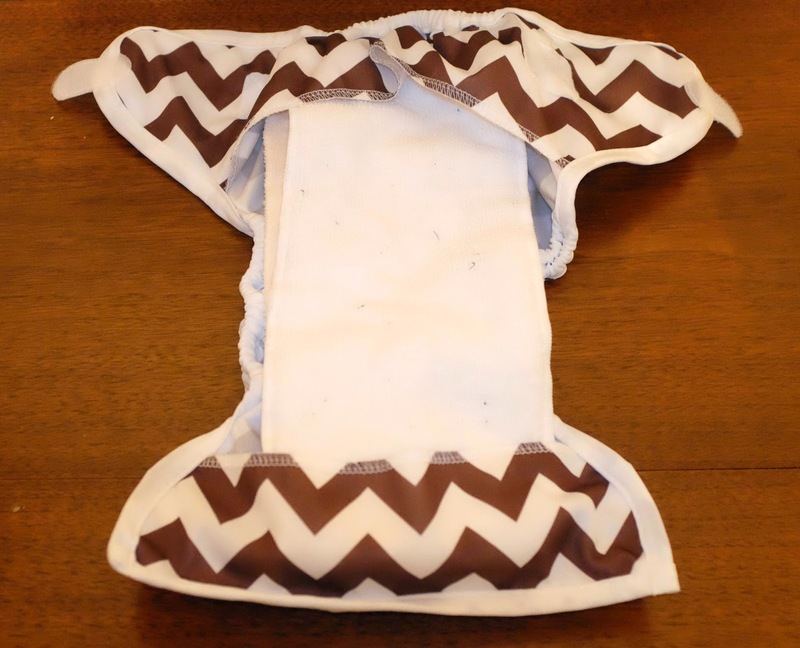 Since starting to cloth diaper almost a year ago, Bumgenius 4.0 and the Blueberry Pocket diapers have been my favorite. They cost around $18-$20 a piece if you buy them brand new but they are so convenient because you just stuff and go. You treat them just like disposables, a one time use before washing. I finally figured out a system that works well for us at night. I bought four hemp inserts (these from Amazon) and they are amazing. I double those with a microfiber liner in one of the pocket diapers and I swear some mornings Rhett's diaper weighs more than he does but he is still dry as can be! I also started reading about prefolds and covers and went ahead and bought some to try. I am extremely surprised but I love them. They are SO easy to use and so versatile. Plus a million times cheaper! I bought 10 prefolds (six bamboo and four cotton, I have two more bamboo on the way) and three covers (a Nicki's cover, a Rumparooz's cover and an Econobum cover). If I am using for nap time I layer with an extra insert and the covers can just be wiped out (unless they get poopy) and reused. 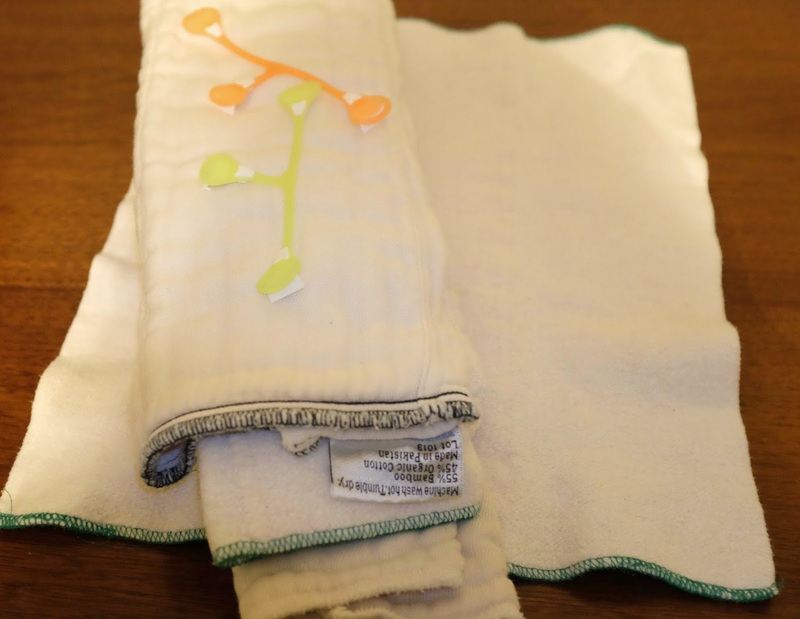 I always stuff my pocket diapers when I am taking them out of the dryer, makes it much easier at changing time. 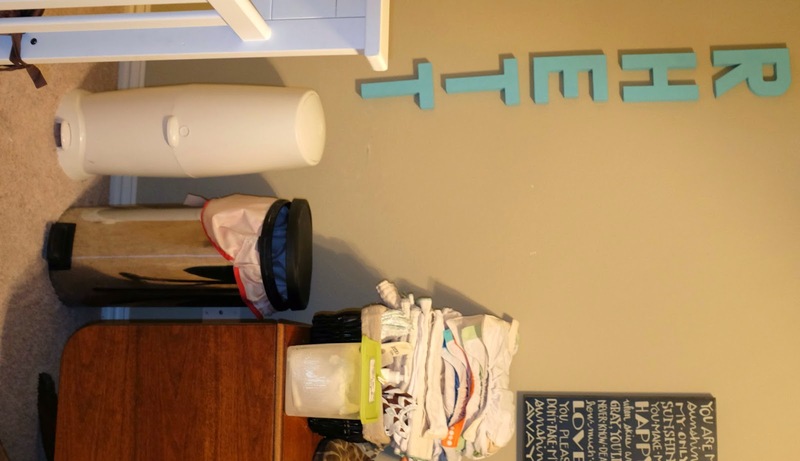 I use the diaper genie for the occasional disposable diaper, for wipes and for the dirty disposable liners and the old trashcan works GREAT for my wet bag with the dirty cloth diapers. When it's time to wash I just take the bag out and put them all (including the bag) straight into the washer. So, that's my system and what works for us. 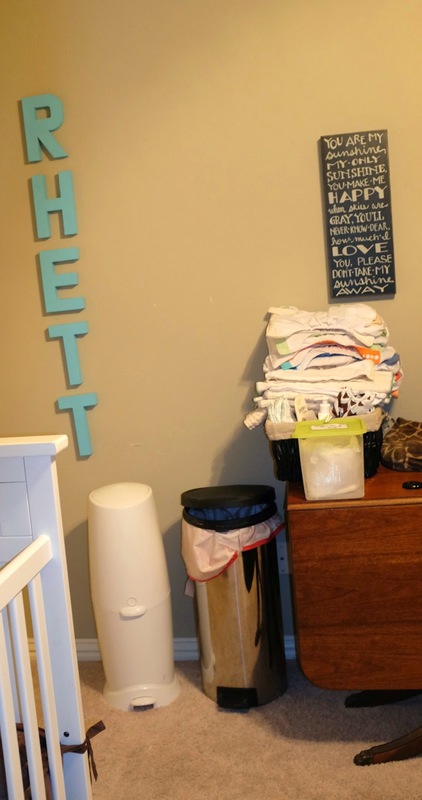 The one thing I haven't quite worked out is that every time I need to rinse a dirty diaper I have to take the diaper and the whole wet bag out of the can to the bathroom which is on the other end of our house, it is a little inconvenient but it works okay. I now have enough diapers to go three days in between washes. Which is about perfect for us. I am still debating taking prefolds on vacation with us because I am worried about Rhett's skin with using disposable wipes and diapers all week, I haven't made up my mind yet. 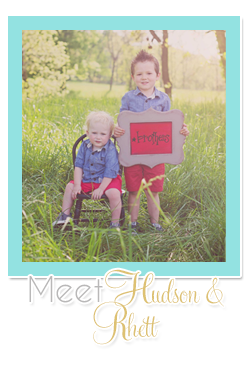 I am a little different than other people who cloth diaper (I think) because I didn't really choose to do it, but I couldn't stand how red and raw Rhett's bottom was when we used disposables, so it was an easy choice for me, and now that we have a good system I love it. Lisa wrote a post about prefolds yesterday too, you can hop over here to check it out! 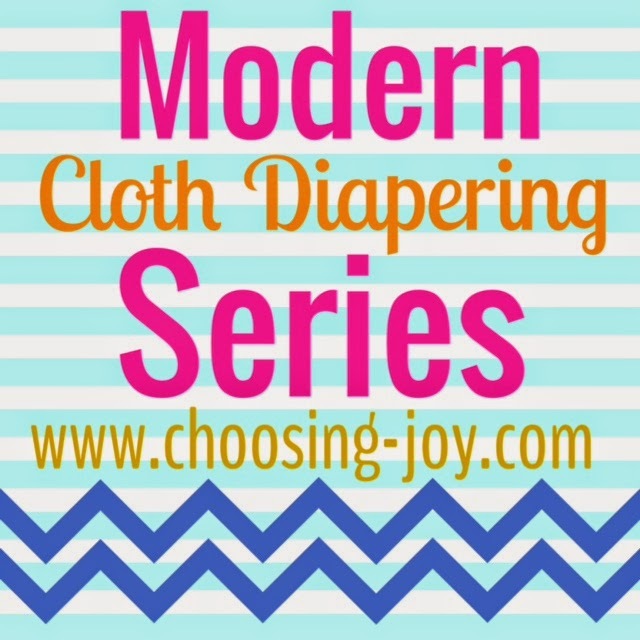 I've never used cloth diapers before but I have had a son with eczema and skin issues. 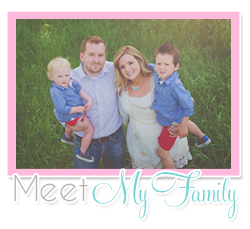 We went to Seventh Generation diapers and wipes with him and Dr. Smith's ointment and it worked perfectly! With our third baby, I found Earth's Best was more absorbent so that's what we use now. Each baby is different : ) Just a thought if you were looking to go disposable for vacation. I have some Seventh Generation Diapers that I got as a sample (two boxes worth), I put one on his yesterday to try it out and so far so good, thanks for the pointer! Nora's skin is super sensitive and always gets a rash with disposables too. Ah thanks!! We can't use the regular swaddlers, I am trying out some 7th gen right now, that will give me an idea of what to buy when we get there! And I agree, if I forget the wet bag in my car or in my purse I am totally grossed out.